I actually remember where I first had Thai food. It was when Thai 55 first opened on 55th and Everett in Chicago sometime in the 90’s. By then there were few good Asian cuisines around. Though sushi had taken off. But, before the likes of PF Chang, a higher end Chinese restaurant chain, which was founded in ’93, Chinese food had basically deteriorated to a fat greasy mess. So, Thai was a refreshing change. In the early days, one of the proprietors, who was heavily pregnant at the time would sit in the back of the tiny restaurant threading endless ribbons of raw chicken onto skewers for the satay. 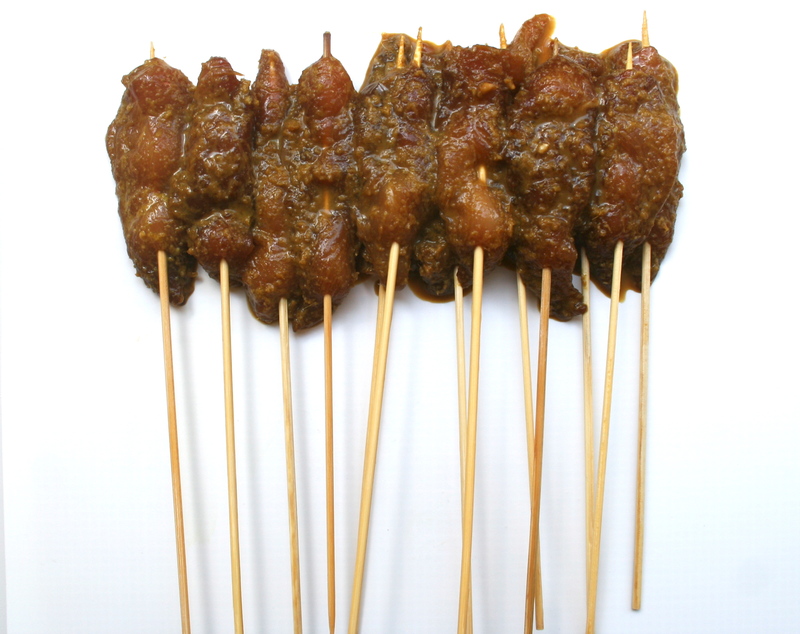 The Chicken Satay with Peanut Sauce was my absolute favorite starter (appetizer) at the friendly shop. The food was so fresh tasting and with so many different converging on the palette all at once. It was a celebration of sweet, salty and hot in every bite. The sweetness of the chicken marinade balanced the smoky almost curry like taste. And, I just loved the spicy sweet kick from the peanut sauce and the refreshing zing from the coriander (cilantro). I really miss Tahi 55. I have had Chicken Satay in many cities over the years since, but none come close to the freshness and delicate yet exotic spices on this favorite Thai 55 staple. I have crafted a menu of Chicken Satay, Peanut Sauce, Coconut Rice and a Pineapple Daiquiri. To make it all in one day may be a bit overwhelming. So, at the end of the post are some suggestions on what can be made ahead of time. I hope you enjoy these renditions. 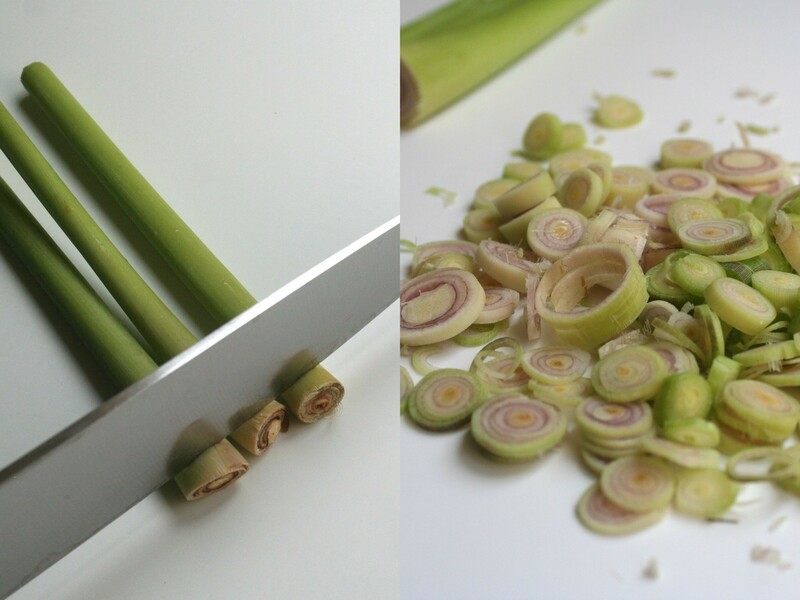 Thinly slice lemon grass stalks. Slice the shallots, mince the garlic and the ginger. You can find lemon grass at most of the larger scale Woolies and Spars. Fruit & Veg usually has it also. 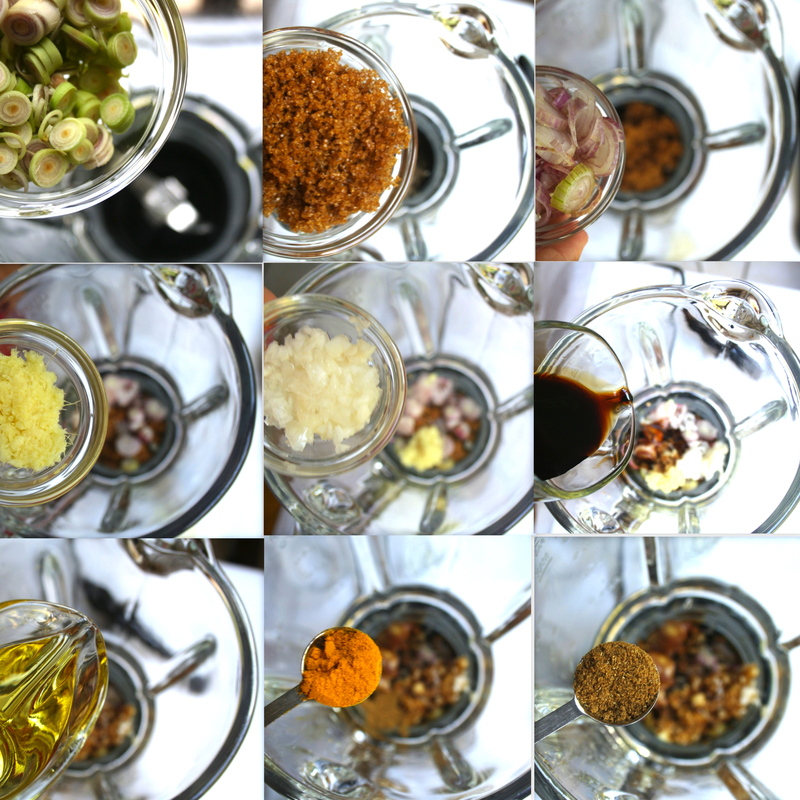 To a blender or food processor bowl and lemon grass, sugar, shallots, ginger, garlic, soy sauce, oil, turmeric and cumin. If using chili or cayenne and fish sauce, add those also and blend until smooth. Scrape down the sides and pour into a bowl that will accommodate the marinade and the chicken. Thread chicken breasts on to wooden skewers. You should have 12 – 14 skewers. The key to the chicken not sticking is to turn it often at first. As soon as you put the chicken skewers on the grill, turn them a few times. Because they are rather thin pieces of chicken, they will cook quickly, so don’t walk away. You can also broil (heat from the top) them in the oven. Serve on a bed of greens or a big leaf from the garden. Add the chicken to the marinade and cover with plastic wrap. Push the plastic wrap down into the bowl so it is touching the entire surface of the mixture. Place into fridge for about an hour. 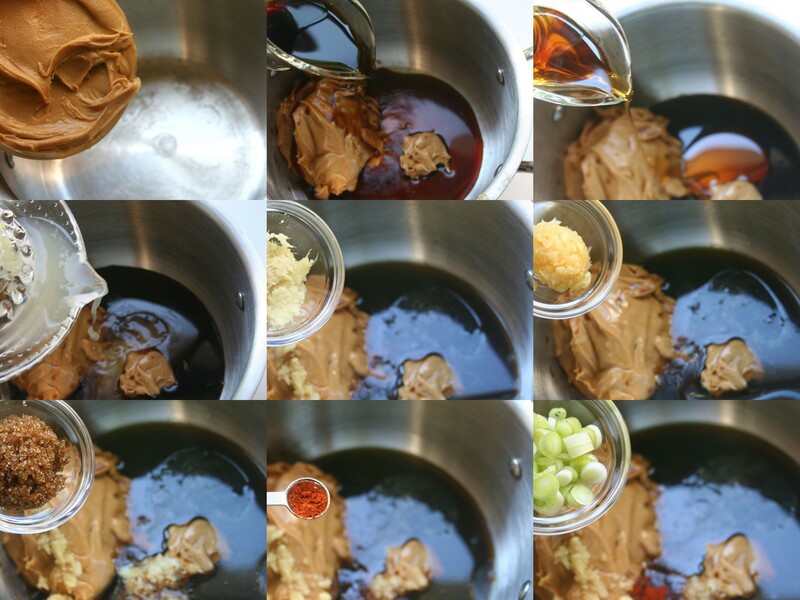 While the marinade is in fridge, soak wooden skewers in water. You can also stat on the Coconut Rice and the Peanut Sauce. 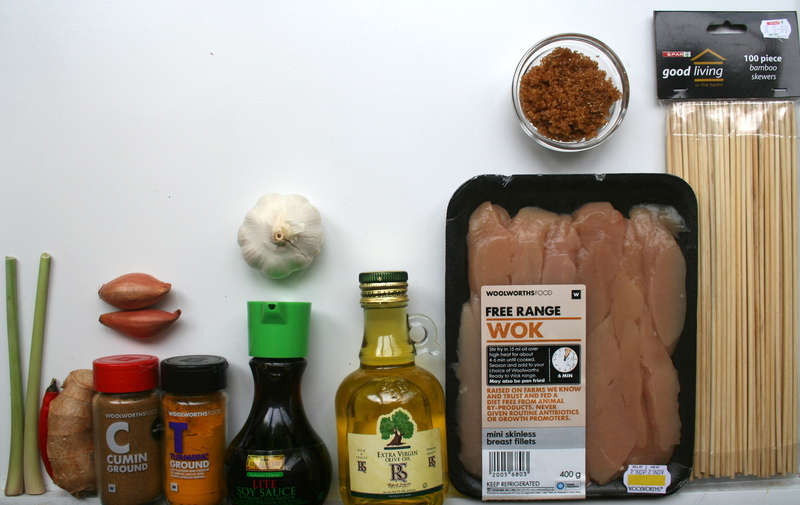 Recipes and instructions for Coconut Rice and Peanut Sauce follow the Chicken Satay recipe. Here in South Africa, too often my rice is mushy or crunchy. I find I must experiment with each type of rice before I can strike the correct rice/water balance. Problem is, I can never remember which ratio goes with which type of rice. Any hoo. 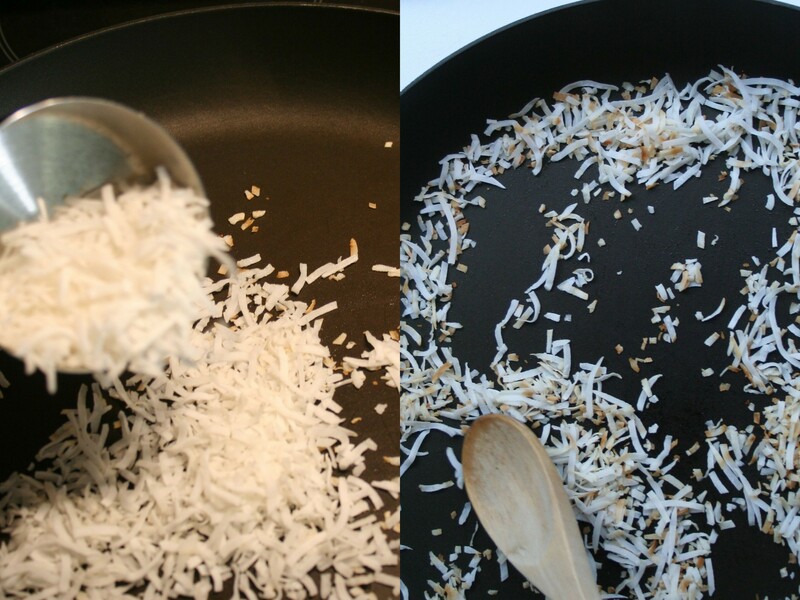 As I was perusing rice recipes online, I found Perfectly Cooked Coconut rice on the Steamy Kitchen blog. I thought it would be a nice compliment to the Chicken Satay. I followed the recipe exactly and transformed two cups of the milky white grains into mealie pap (grits). The flavor was good so I made it a few more times and I think the version below is just right! Put butter, sugar and salt (if using) into a medium heavy bottom pot on medium heat. 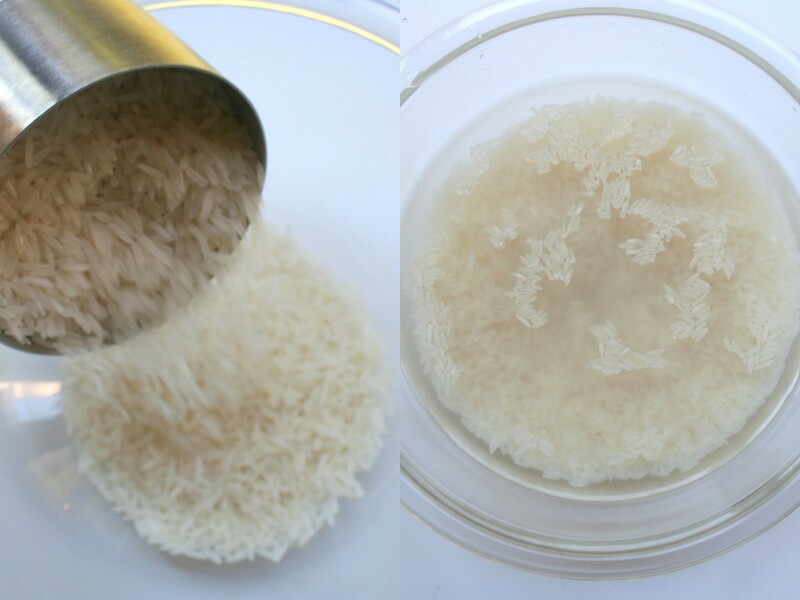 When the butter is melted and the sugar dissolved, turn up to high heat and add the rice. 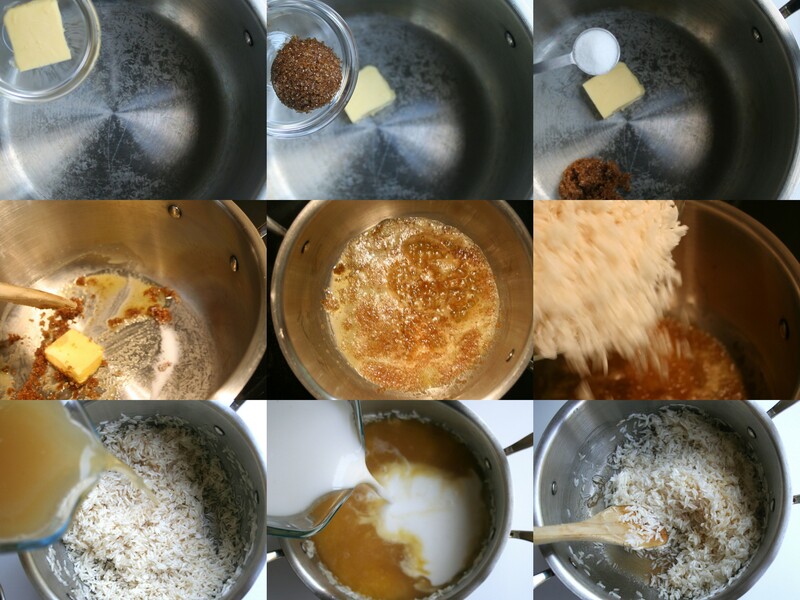 Mix until all the grains are evenly coated in the sugar butter mixture. If using fresh coconut, crack it open with a hammer. If it has liquid in it, you will want to crack it open over a large non breakable bowl inside the sink. 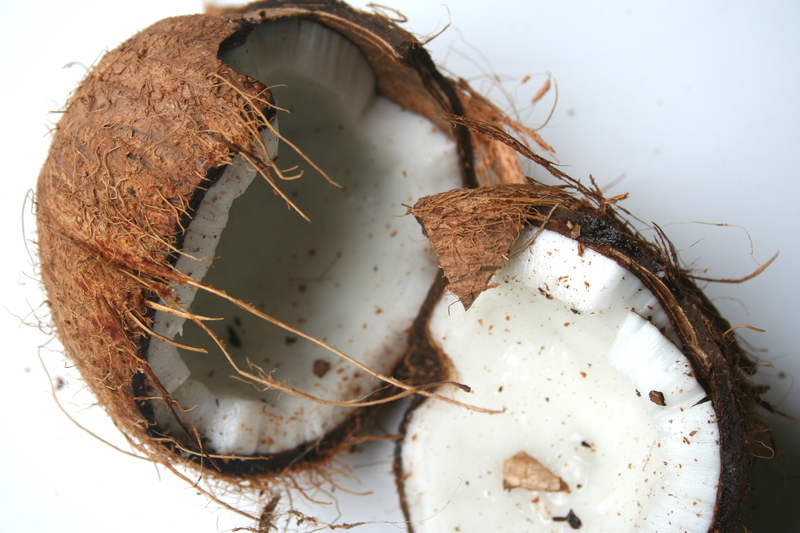 If using fresh coconut, break the coconut into pieces and with a knife, peel off brown skin. Drop several pieces into a blender or food processor bowl and process until pieces are about he size of grains of rice. Toast coconut in a dry frying pan on medium heat. It burns fast, so don’t walk away. 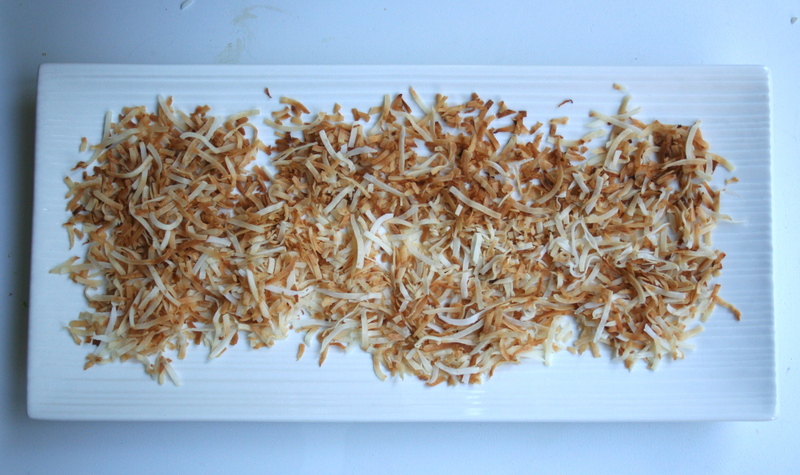 Spread coconut in a shallow dish to cool. Set aside. Can be made a few days before and store in an airtight container. Garnish rice just before serving. 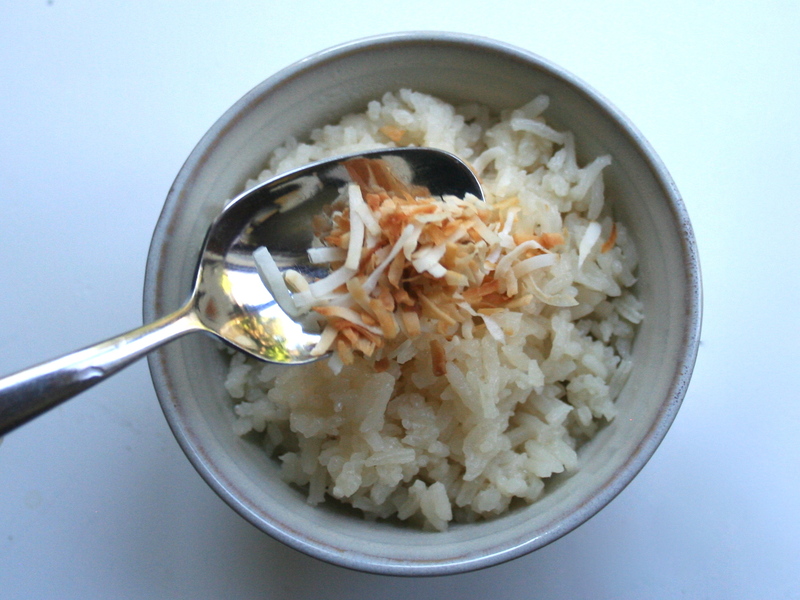 Sprinkle toasted coconut onto rice to serve. Add butter, sugar and salt (if using) to a medium sized heavy bottom saucepan, cook over medium heat until butter is melted and brown sugar dissolved. Turn heat to high, add drained rice, and stir until all grains are coated evenly. Add coconut milk and chicken stock. Give it a good stir. Once boiling, immediately cover with tight fitting lid. Turn heat to low and simmer undisturbed for 20 minutes. Remove pot from heat, ‘but do not open lid and do not peek’, Jaden from Steamy Kitchen admonishes for an additional 10 minutes. Sorry. I peek. And, I give the rice a quick stir after the first 15 or 20 minutes of steaming. What I find is that the rice on top doesn’t always steam enough, so I give it a little help. 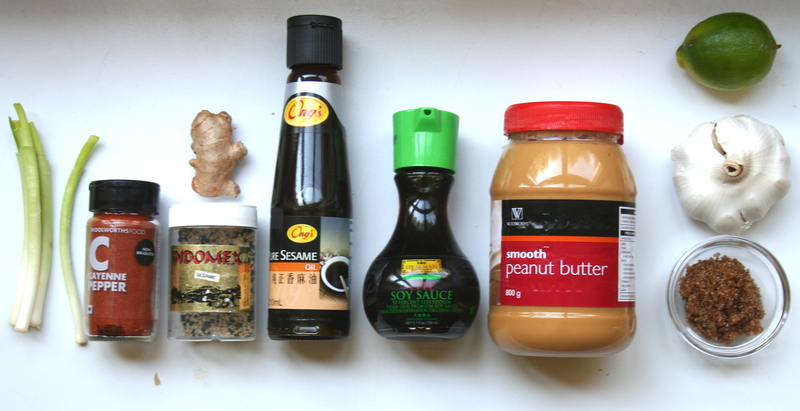 While rice is cooking, toast coconut and start on Peanut Sauce. 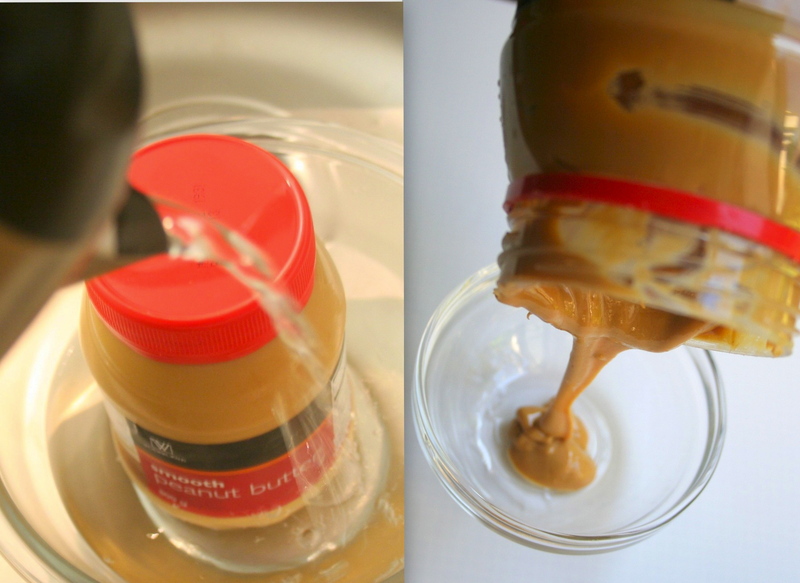 An easy way to measure the peanut butter, is to put it in the sink and pour in hot water. Let it sit for a few minutes. Then you can just pour it out. To a small size heavy bottom pot, add peanut butter, soy sauce, sesame oil, lime juice, ginger, garlic brown sugar, chili or cayenne and onion. Stir until well blended. Pour into serving dish and set aside. Garnish with sesames seeds just before serving. Can be made a day or two before and stored in refrigerator. To a small size heavy bottom pot, add peanut butter, soy sauce, sesame oil, lime juice, ginger, garlic brown sugar, chili or cayenne and onions. Stir until well blended. One to two days before make the peanut sauce and store in fridge. Save the garnish unit the day of. 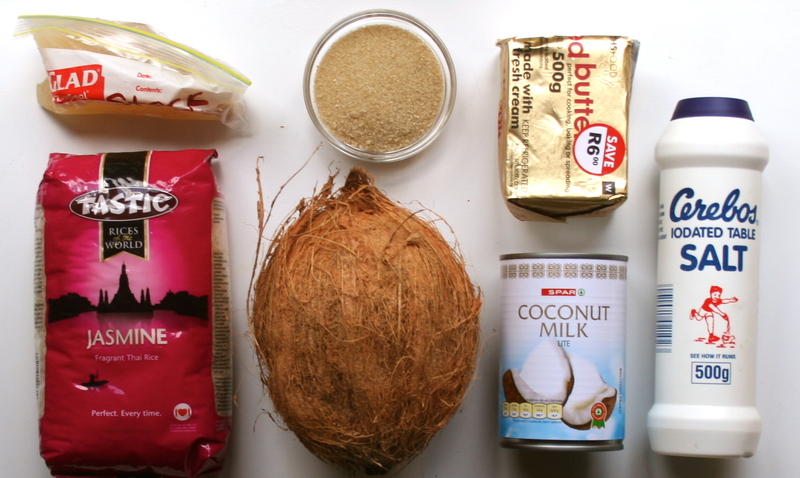 At the same time, you can toast the coconut for the rice and store in an airtight container until needed. You can also put your pineapple in the freezer a few days ahead as well. One day before make the marinade and add the chicken store in fridge. Soak skewers. After the chicken has had a chance to marinate for an hour or so, you can thread the meat onto the skewers and stick them back in fridge until ready to cook. On the day of, fire up the grill. Start the rice. Once it has finished boiling and you have turned it down to a simmer to steam, you can turn your attention to the chicken. Put the chicken on the grill turning it often maybe 3 or 4 times in the first 3 or 4 minutes to prevent serious sticking. They cook quick so don’t walk away!!! You will want to make the Pineapple Daiquiris just before serving. 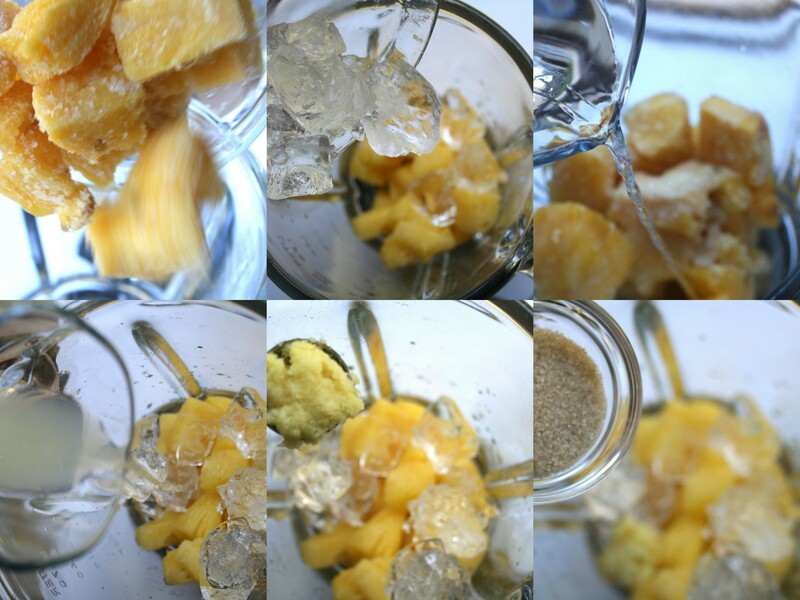 Into a blender bowl, toss in the pineapple the ice. Pour in the rum and the lime juice. Now add the ginger and the sugar. 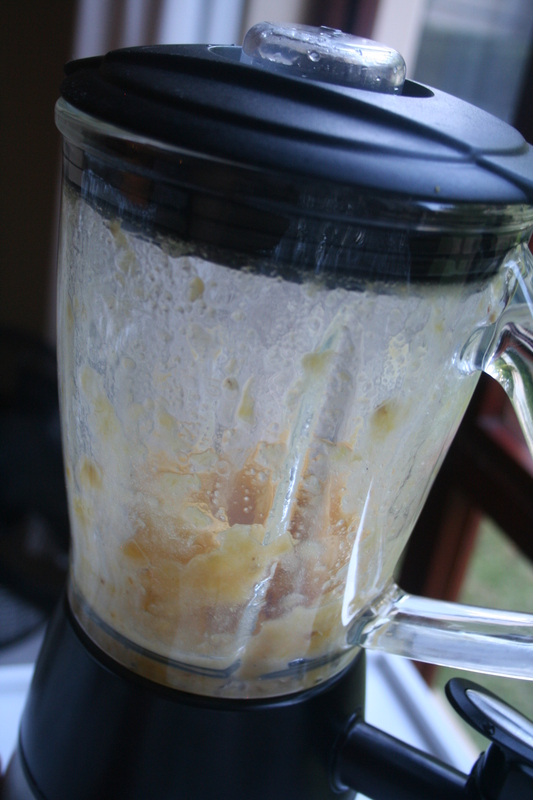 Give it whirl until all the ice and frozen pineapple are completely pureed. Pour. Enjoy. Photo on right taken of me, by Rhonda Scott @ a progressive NYE Party. I served my Chicken Satay, Peanut Sauce and Pineapple Daiquiri! Put all ingredients, except the mint, into a blender bowl and blend until you have a luscious frozen Pineapple Daiquiri Freeze. Pour into two glasses. Garnish with mint or pineapple wedge. Chelle said, you are trying to kill her. Lol. Well yeah, I guess this would be a lethal combo. How about just the rice?? The rice is really good. Well, no I guess the rice is a no go too with the chick stock and coconut milk. But, it is soooooo good.